Built in 1958, the East St. Paul Collegiate hosted high school grades previously held at the nearby East St. Paul School. 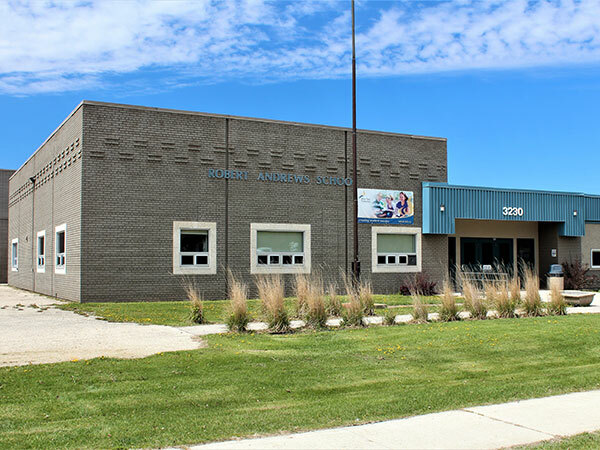 Its catchment area included students the Rural Municipality of East St. Paul, Donald School District, and Rural Municipality of North Kildonan. In the fall of 1960, staggered classes were held here for students who later transferred to the River East Collegiate upon its opening. After its use as a high school in the River East School Division ended, it hosted a wider span of grades and was renamed in April 1964 in commemoration of local market gardener and civil servant Robert Percy Andrews. When early grades transferred to the newly opened Birds Hill School in 1987, the school became a junior high school. The building has been expanded several times, in 1966 (four classrooms at a cost of $66,000) and 1975 (gymnasium and general improvements). Ronald Paul “Don” Dubinski, ? “Staggered classes set at East St. Paul Collegiate,” Winnipeg Free Press, 28 August 1960, page 48. “Named after ex-trustees,” Winnipeg Free Press, 22 April 1964, page 11. “Municipality elections Oct. 26,” Winnipeg Free Press, 3 October 1966, page 4. “Suburban referendums and bylaws,” Winnipeg Free Press, 27 October 1996, page 13. “School addition vetoed by board,” Winnipeg Free Press, 27 February 1975, page 11. “Board approves appointments,” Winnipeg Free Press Weekly North Edition, 2 July 1989, page 3. Heritage II, A History of East St. Paul by the RM of East St. Paul, 1991. “Attitude adjustment,” Winnipeg Free Press, 1 September 1992, page C19. School division half-yearly attendance reports, Schedule: E 0757, Archives of Manitoba.